We arrived in Gatwick at about 3.30am Cyprus time. Knackered and ready for bed we headed to the Premier Inn for a few hours before heading to the terminal to catch our flight back to Guernsey. Unfortunately Guernsey weather is rather unpredictable so we sat around waiting for the fog to clear. 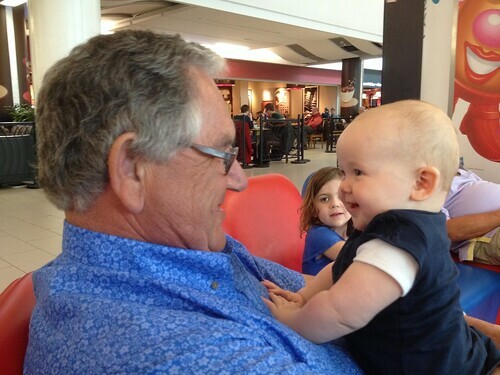 Thankfully we had some small children to keep us entertained. We finally got home at about 4pm and I am completely exhausted! Three loads of washing later I am in bed early and ready for work tomorrow! Our last day in Cyprus was spent tidying up the villa, packing and sorting things out. We also had a little bit of time around the pool before setting off for the airport. This is my favourite photo form the holiday. We have had a lovely time but I will be pleased to go home. 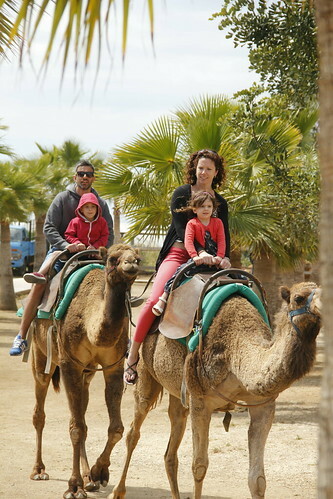 Another very windy day today so we headed to the Camel Park in Larnaca. We weren’t quite sure what to expect as some of the tourist attractions around here are really very mediocre, but we were pleasantly surprised. Loads of camels to feed, and quite a lot of little baby ones, including one who had been born about an hour before we arrived so had yet to stand. We spent ages watching it and seeing if it was going to get up but it didn’t before we left. My sister and her family and The Mister went for a camel ride. I declined on the grounds that I didn’t want to give the camel a bad back! Day 100 and you get a picture of a stone bridge! The weather has been a bit changeable today so we went to the Ocean Aquarium in Protaras. To be perfectly honest it was really quite rubbish. The fish bit was ok but outside there as some scuzzy pens with unhappy looking animals and it smelt horrid. The worst bit was the crocodiles who were in a horrible concrete enclosure. It just wasn’t nice. So, after that disappointment we went for a lovely drive around the coast. Dad and The Mister walked down to see some sea caves whilst I sat in the car and read my book whilst the children slept! We then found this stone bridge which is sadly now fenced off so you can no longer get photos standing on it! 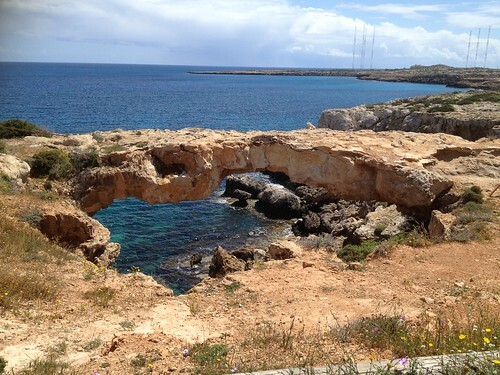 Cyprus is lovely if the weather is good, but when it is a bit iffy it is a little bit disappointing. We have had a lovely time though and I feel properly relaxed for the first time in ages! 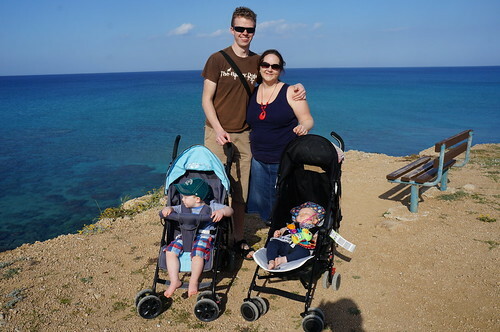 Today The Mister and the kids and I went for another wander around Agia Napa. This time we went into the museum (OK but a bit dull) and to the remains of the monastery. It did strike me as really odd that the ancient ruins were right next to the clubbing district and all the strip clubs. We had a lovely day, just ambling around, eating ice-cream and not really doing much. Tonight we went out for a delicious meal where my brother-in-law got mistaken for a local for the third day in a row. No chance of that with my boys. They are far too fair to be local! Today Dad, The Mister, the kids and I travelled over the border from South Cyprus to North Cyprus. I didn’t expect it to feel like such a definite border crossing but there were guards, passport checks and we even needed to get different car insurance. We went to a town called Famagusta which is just over the border and has a rather lovely walled city which we wandered around. There is a mosque right in the centre which from the outside looks like it is going to be derelict but it is still in use and houses what is allegedly the grave of St Nicholas. 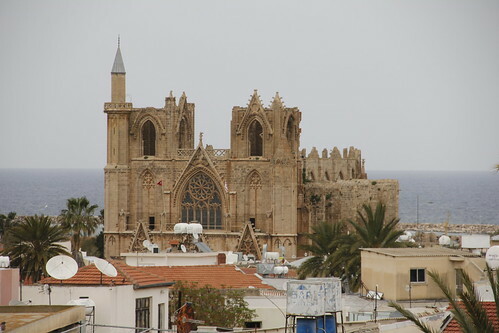 Famagusta is also famed for having what is called Varosha, the ‘Ghost Town’ which was a district of the city. In 1974 when Northen Cyprus was occupied by the Turkish, the residents of Varosha were evacuated, expecting to return at some point in the not too distant future. In the 1970’s Varosha was a thriving tourist area with lots of big hotels. However, following the evacuation and to this day, this area remains unoccupied and the place s corned off with guards preventing people coming and going. It is in such a state of disrepair and the is still dispute over what will happen to it. It was a lovely day, only marred by the fact that The Little Mister managed to hurt himself at a kiddies play area and we ended up taking him to A&E to get him checked over. He seems ok though but it gave us all a fright. Another lovely day although much breezier so it felt cooler. 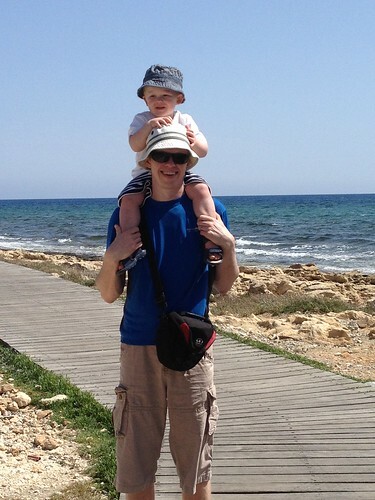 Today we went for a wander around Aiga Napa or Ayia Napa as it is known by the English. There is a lovely little fishing harbour which is quite traditional but then you have the swathes of plastic grimness that makes up all the tacky tourist bars and clubs. I know that I would absolutely hate it in the height of season! 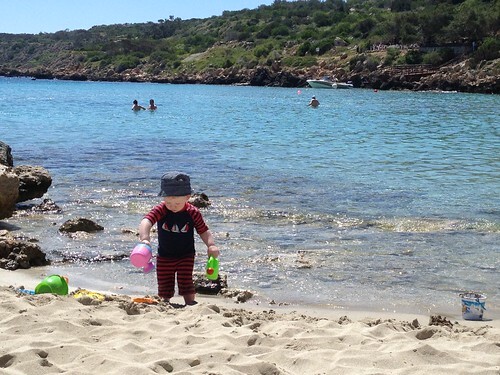 The Mister and The Little Mister look so alike these day, especially when they are wearing their sun hats! Today we went to an aquapark called Waterworld. It was the opening day of the new season so was blissfully empty and perfect for us. The kids and grown ups went on a few rides and we topped up our tans. A lovely day but I think we are all quite worn out from enjoying ourselves! 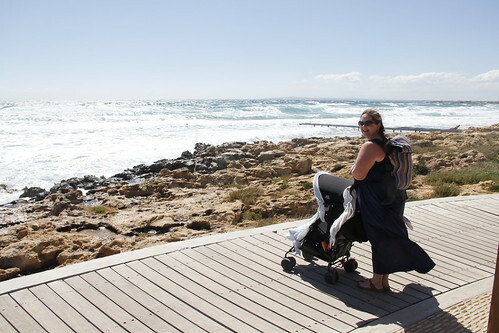 It has been a lovely day – warmer and less windy and perfect for a trip to Konnos beach. Such a lovely beach with a small tide and really safe for the kids who spent ages happily splashing by the side of the water. The villa company very kindly provide buckets and spades and other bits and bobs so they had plenty to play with. After this we returned to the villa for a little sit down before heading out to Protaras for a delicious pizza. Today we have had a slow and relaxing day. A trip to the supermarket, a lazy lunch and lounging by the pool. 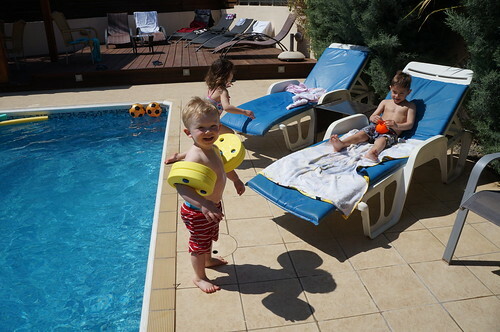 Here is The Little Mister showing off his envious figure with his two lovely cousins.